" DARK DESTROYER. " prince buster all stars. PRINCE BUSTER VOTP 7in 1964. "** dark destroyer. ( aka the tickler. )" the prince buster all stars. other side: " good for creator. " lor creator. 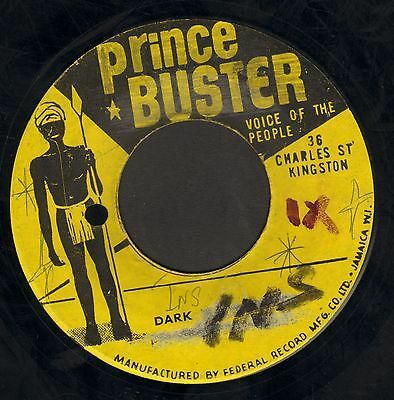 prince buster voice of the people record label 1964 jaorig. the condition isa couple of light superficial hairline marks / scuffs short of ex / vg++, marks do not affect play, just over vg++, lovley copy. listen to clips in commerce player. this is the original ja pressing. RECORD GRADING & ADDITIONAL INFORMATION. My records are graded visually, sound clips will be added to all my records so you can hear what you are buying and recorded flat without any added equalisation, most pressings are different in some way or the other so you are encouraged to listen before you buy, sound clips will be added usually within the first three days of the auction. UNPLAYED / NM: old shop stock, the vinyl (album) factory sealed in shrink wrap. in some cases will be open to make sound clips. ( this will be mesioned in description.) 7in in this grade will be played to make sound clips only. NM: the vinyl is visually in top shape, no marks or scuffs. EX+: the vinyl may have the odd superficial hairline mark which does not affect play, gleaming shine on both sides of the vinyl. EX: the vinyl as been handled and played very carefully, the vinyl may have some very minor flaws like ultra light sleeves scuffs & light spindle marks, strong sheen on both sides of the vinyl. the vinyl will still play very clean with very minor to no surface noise at all. VG++: the vinyl will show signs that it as been played, the vinyl will show signs of light scuffs and superficial light marks which do not affect play, the vinyl will play clean with minor surface noise in some cases, in most cases the vinyl will play ex, decent sheen on both sides of the vinyl. VG++ / VG+: in the middle. VG+: the vinyl will show signs that it as been played, the vinyl will have more light scuffs and the odd light mark which went felt with hand will not stand out. VG+ / VG: in the middle. VG: the vinyl will show that this record as been well played, scuffs, light visable scraches, small nicks, light surface noise in most cases, nothing to distressing. VG-: the vinyl will look well worn in most cases, the vinyl may play with surface noise, in some cases the vinyl may look bad but plays better than it looks, in these cases this will be mensioned in the description. G: the vinyl is in bad condition , heavy scuffs and marks will plays with surface noise. Record labels on both sides of the vinyl will be scanned and uploaded, here you can see for yourself the condition for marks or any other defects if any. Albums up for sale the sleeves will be described according to condition in description area. All sound clips will be taken from the records up for sale and recorded flat without any equalisation to try and enhance the sound quality. These numbers & letters ( markings on the dead wax. ) will be added for blanks and test presses, 7in, 12in & albums.